This is a photo of two men, one of them Abram Boldt, posing in front of a backdrop. 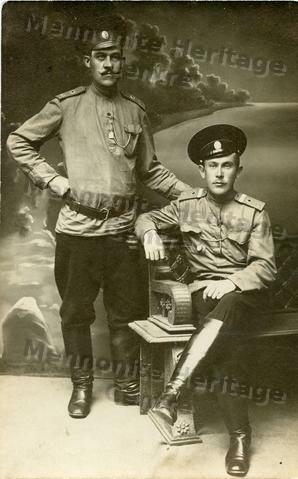 Both men are wearing peaked caps, tall boots with pants tucked in, tunic shirts with epaulets and belts. One man is sitting on a bench and the other is standing be hind him.